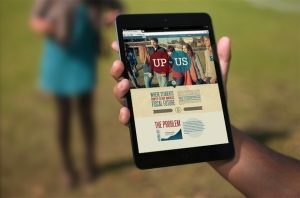 Big Idea was recently commissioned to redesign the website for a nationwide university movement, in which students compete as teams to solve the U.S. National Debt crisis. ItsUptoUs.org was a unique project in which we set out to engage the viewer and keep them on the website through a series of interactive elements. By implementing a responsive site design and up-to-date technology we were able to achieve a site that works across all devices seamlessly.